You're Ready to up-level your Business and Life! Are you a female online entrepreneur who's ready to make more money and create more time in your biz and your life? Then this four month Biz Builder one-on-one program is for you! Time to ditch the Mazda lifestyle and step into the Maserati, baby! Make more money yet have more time. Is this the balancing act you want to master? To be able to have the lifestyle you thought starting your own business would give you? To be able to end every day feeling great about what you achieved in your business and then head out for some you time? BIZ BUILDER is my exclusive one-on-one program that is tailored to build your business by growing your reach, and teaching you how to consistently convert and retain clients. All without giving up the lifestyle you desire! Are you feeling overwhelmed by all the things you need to do to grow your business? I can identify! When starting my (multiple) businesses, I experienced the same emotion. I loved what I was doing but I was majorly stressed about how I would fit everything into the day, what and where to spend my money to get the best ROI, and how to service my current clients while marketing to new ones. I certainly wasn’t going for coffees and running on the trails in the sun as I had hoped I'd be able to do. Even worse, failure was forever lurking in the shadows. Would everything I had worked so hard to build collapse? How was I going to make enough money to keep this business moving forward? Was it only a matter of time until it all crumbled before my very eyes? No wonder I couldn't sleep! I am here to tell you that if I can do it, you can too. It's time to lose the worry. It's time to get clear on the direction you want to take your business. It's time to map that out AND TAKE ACTION! It's time to have the business of your deepest desires. when you're honest with yourself, you see clearly that you desire support to move your business forward. Because you know that if you could have done it all by yourself, you would have done it by now. You weren't meant to go it alone! I'm here to help! Well, my name has the secret – Penny. I was born to be a money-making entrepreneur! Sales is in my heart. I have grown ugly accounts into top performers. I've had 35% year on year growth in markets that normally see 2% tops. I've managed and grown portfolios of over £15 million. Yet I always wanted to be free of the 9-5 (or in most cases the 8-7) and make my own mark on the business world. So I decided to use my passions to fuel my work. 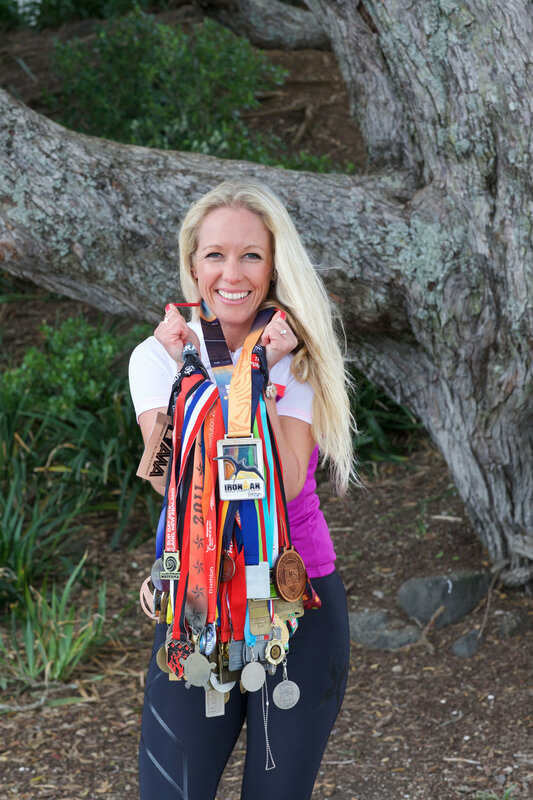 Having completed 18 Ironman races, including the World Champs in Hawaii, and over 40 marathons, it was simple to start a business in the fitness world. With this amount of training, I also love to eat, so I quickly developed additional businesses around nutrition and wellbeing. I was never without an idea on how to make money from my passions. What I was without was an entrepreneurial support network. I would start off with complete devotion, passion, and sheer determination. Yet, I was without a solid plan. Crazy really, yeah?! I would NEVER stand on the start line of an Ironman or marathon without having a well-executed plan. I even preached this to other athletes. But somehow I expected my businesses to take off without hiring a coach or making a concrete plan? Madness! I knew I needed to invest to get the results I desired. (Aren't you telling your clients the very same thing?) When I finally "bit the bullet" and invested in a high level coach, set out a plan, did the mindset work and THEN ‘sales practised’, I began to smash all my sales targets. With the help of my coach, I was able to build the business I had been dreaming of all along (and drop the ones that weren't serving me). Do you want to JUMP out of bed excited to work with your dream clients? You totally can! And I can help make it happen for you. Now, I work with clients all around the world that light me up on a daily basis! I relish in seeing their progress and getting those notes that they killed yet another sales goal. I love seeing their families' lives transformed by their financial success. And I want to see that happen for you, too! Make the money you desire in your business? Schedule time in your day on YOUR terms? Feel secure that your business is going to last and grow with you? Confidently tell friends and family that you and your business are a HUGE success? Remove the words ‘I’m too busy’ and ‘I’m too stressed’ from your vocabulary? Be proud to put your business name into Google and see the results? Know that where you are spending your money you will see the returns? If you're like me (and you probably are if you've read this far! ), you want all of this: the social life, the time to be healthy, the full bank account, and the dream clients. You're ready to take action to elevate yourself and your biz to get there today! WHEN YOU JOIN BIZ builder, YOU AND YOUR BIZ CAN LOOK COMPLETELY DIFFERENT IN JUST four SHORT months. I am here to guide you to execute your vision. I’m here to condense your timeline to success. Who are they and what drives them to you? topic 12: How Far Have You Come! Celebrating in style…I love bubbles! Ready to have a clear path for your business? We connect! You will book a FREE 30 minute discovery call with me. We can have a virtual coffee. Mine’s a long black. We explore your biz needs and see if we are a good coaching fit. You will invest in your coaching package, and I'll send you a customised contract and Welcome Pack. This will help you go deeper into what is holding you back, your areas of need, and what you desire to gain out of the program. You'll be taking action even before we start working together. We set a standing weekly coaching call appointment. During each call, we map out the road to your goals. You’ll share with me your blocks and needs. I’ll provide guidance on how to keep moving forward and draw out the potential you have within you. I’ll give you all my tips, tricks and experience. After each call I will send you your BizWork for the week ahead. 12 (60 minute) calls with me where I support you. I provide motivation for you to take action, keep you accountable, and give you the knowledge to make the BEST decisions for your life and your business. Unlimited email access. Yep, we stay in contact throughout the 4 months. I will respond within 24 hours to tackle all your biz questions. Tailored resources for you to use within your business and life. These include modules, templates, research, video and audio. VIP track is available on request where all tech systems are set up for you. "When Mum died I didn't want to continue my biz...I have now raised my prices and increased sales by working on my mindset that I can't give away everything for free being a friend." Want to make more money? Have more time? Are you ready to work with me in a Four Month program of pure business-focused work to get your dream biz rocking? It's time to take it up a notch and get the results you love in both your life AND your business. This program is all about making more money, creating more time for you, and inspiring your clients to tap into their own greatness. it's time to trade in the Mazda lifestyle and step up to the Maserati! When I finally decided to enrol with my coach I realised that I had deliberated on the decision for so long the same course ended up costing me $8,000 more. Not to mention the loss of business while I floundered around on my own. I hate to think about the hours of personal life I have poured into lost opportunities too. I was determined to do it on my own. I thought Google would see me right on everything. After trying many systems, filling out forms for downloads, spending money on adverts that were getting 4 'likes' and not tracking any conversion, I succumbed to the fact I needed help. Once I flipped the switch and applied my athletic training and coaching mind set to business, I have never looked back. With the support of my coach and other like-minded entrepreneurs, I'm confidently walking the path to my dream business and dream life. Why not get that support too from someone who has been there and knows how to elevate you and your business? There is absolutely no need to go at business alone. Sure, it's your baby, but most mothers have help! I believe in keeping that passion you had when you first started your business ALIVE. Keeping your energies high to give your clients the best service. AND creating the freedom you wanted by being an entrepreneur. This program is all about making more money, creating more time for you, and inspiring your clients to tap into their own greatness. You were put on this planet to serve and have a rip roaring time doing it. Own it, claim it, live it!